Today I had a near-death experience. Well, it felt like one anyway. I was trapped in a narrow stairwell in an underground carpark. I had opened and closed a door behind me, believing I would walk out onto the streets outside. But instead I discovered nothing but stairs, doors which locked from the inside, and concrete. I tried each door, but to no avail. They would not open. As it began to dawn on me I couldn’t get out, I tried to imagine how long I could last in there without losing my breath. I was in a small space, surrounded by walls and one small vent. The vent seemed to be enclosed, allowing minimal air in. I felt a bit lightheaded after only a couple of minutes in there, and started to panic. I then went systematically to each of the four doors and banged and knocked, hoping someone in the quiet carpark would hear. Then I just settled on one one door and banged, called out and knocked for a while, praying and seeking God’s peace at the same time. “Thank you so much!” I said with relief. I walked out and found daylight – this time, through the correct exit. I smiled at the strangeness of life and the goodness of God, before realising I was quite rattled by the experience. 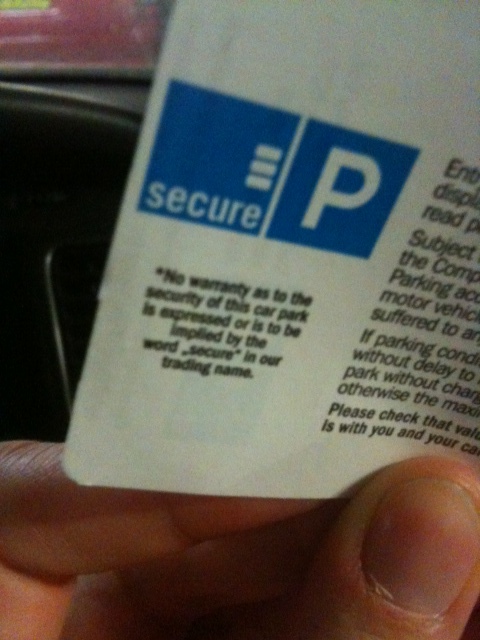 In other words, even though their trading name was ‘Secure’, it didn’t mean that I, nor my car, would be upon entering. There are no guarantees in life, especially when it comes to our security. And this company certainly wasn’t promising any. In my moment of insecurity, trapped inside the stairwell, I felt a strong certainty at the same time. I was certain that, should I lose my breath completely, I would awaken again to the face of my beautiful Saviour, Jesus. The one who promises me his loving presence, in life and in death. Sure, I don’t always trust Him completely, as I did in that moment of need. But I do know deep down that there’s no security like the kind found in Him. Thanks for sharing this experience, sister! Very true… our ‘treasures’ truly are in heaven, but it can be hard to remember that sometimes. Thanks for reading and sharing your thoughts, much appreciated. I really, really needed to be reminded of this today. What a blessing you post was to me! Oh Terrie, I’m so glad! May you continue to hold onto Him with all that you have. He is trustworthy and loves you so much. This was really a powerful moment and post, Ali! So thankful for how He sent someone to you and for how you felt secure, no matter what. My heart was pounding some! God bless you and thank you for sharing His messages to us! Thank you Debbie! I’m so thankful too… there’s a reason for every experience isn’t there. God bless you as you share your heart with us today, thank you for being a blessing to me. aha! God’s angel on the move! whew! Praise God for sending that man to find you, even though he didn’t see that God sent him. Yes! Thanks so much Joy, so thankful too. God bless you today as you walk with Him. So glad you are safe and your prayer was answered!. How true, “there are no guarantees in life” the only one we can depend on is God. Blessings to you. Oh wow what an experience! Thank you Lord for being there for my blogger friend. What a scary experience – I’m glad you trusted and God sent someone to let you out. I love the irony that Secure parking doesn’t guaranty security. Hi Sharon! Thanks for reading, and yes, absolutely!! Beautifully expressed. There is no space too small or too wide for Him to reach us in. So glad you are above ground and in the sunshine! All praise to the SON!! Thanks for sharing with us. Blessings and more blessings!! Wow! How terrifying! Praise God he sent rescue! Anytime 🙂 I’m glad your safe! Luv ya! That definitely sounds like an unnerving experience. Ironic about the ‘Secure’ thing. We can’t trust in men–only God will come through for us. So true! Thankful He is everything He says He is! 🙂 Thanks for droppping by, and have a great day. Fanny Cosby – Surely one of the greatest hymn writers of all time, have you ever investigated her life story? It’s fascinating. You can see her tomb stone at a church on The Gower peninsula in Wales. I know a little but yes, I can imagine it would be given the heart in her hymns.